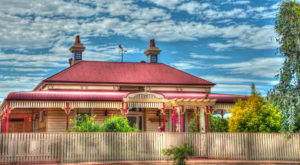 Fences in Australia take many forms from the early days of post-and-wire fences, to today’s contemporary brick, timber and bespoke wrought iron designs. In part one of our series on the history of fences in Australia, we run through the types of rural fences that were popular from 1840 to 1860. In the 1840’s before ‘security of tenure’ was assured for squatters (which was the right of a tenant to occupy a property after a lease expires) enclosures were kept to a minimum. The rural Australian fences around large-scale paddocks was really only to contain horses and bullocks, and people could travel up to thirty miles without sighting a fence at all! One of the first interpretations of a fence was issued in 1844 by the Duke of Newcastle, who was the Secretary of the State for the Colonies at the time. This gave security of tenure to squatters as compensation for property improvements which included fences. As freeholds increased, the number of fences did too as they followed the boundaries of the purchased land. A fellow named Niel Black from Glenormiston in Victoria began advocating for fencing as early as 1840 because he believed that it was advantageous for sheep if they were left undisturbed. Hence, he began shipping large quantities of wire fencing out from Scotland. As well as cost efficiencies, he also cited the advantages of wire fencing as “durability, tastefulness and security from fire”. Along with this, long leases for squatters were promised with an Order in Council in 1847, however implementation was delayed by the gold rush that occurred in Victoria. As a result, wages virtually doubled between 1851 and 1853, so it became even cheaper to build rural Australian fences rather than to employ additional personnel (‘shepherds’) to look after livestock. At first these new wire fences were adapted to the post-and-rail system (see description below), but in 1857 Black’s neighbours, the Manifolds, cleared their land and fenced it with dry stone walls in order to enclose an area of their cattle run. This enabled them to build arched culverts that could cross deep gullies and adequately contain the estimated seasonal water flow. By the end of the 1850’s most squatters disagreed that sheep were better shepherded, and only leased land remained unfenced. By the 1880’s shepherds had largely disappeared and were replaced by boundary horseback riders and fenced paddocks. Brush or deadwood fences were the earliest and most primitive types of Australian fences and consisted of bushes and trees that were felled during the clearing of bushland. These were dragged into long lines with branches piled on top, and the more pliable branches interwoven among the pile. Gaps were plugged with brush, forming an impenetrable, continuous reinforced structure. In the 1860’s and 1870’s Australian fence history reached another level when brush fences were phased out by chock-and-log fences. However, these were only feasible where straight lengths of timber of a certain length and diameter were available. Construction involved placing four posts in the ground with ‘chocks’ (or wedges) between them at right angles to the fence’s direction. A cut was made to the upper face of the log, another chock placed in it at right angles and then another log was placed on top. This was repeated up to three or four logs in height, and there was usually a two-foot overlap in the logs. When constructed of heavy timber (the preferred was Murray Pine), these averaged five feet in height and were extremely durable. Forks-and-poles or cockatoo fences were built by felling saplings to form the corner post of a milking or horse yard. Another length was then taken off to be split into rails. Fork trestles were then fashioned every nine feet, a rail placed inside the fork and then another one placed on top. Dog-leg fences were made up of five pine or buloke (a type of ironwood) logs each with V-cut tops and bottoms at the ends. Similar to a chock-and-log fence, this allowed the logs to sit securely above each other, and occasionally the rails were attached to live trees as posts. Palisade or Kangaroo fences were made by cutting saplings, straight branches and split trunks into consistent lengths from seven to ten feet. A continuous trench of two to three feet was then dug and the timber stood upright in it. Excavated earth was then back-filled and rammed tightly around the uprights and saplings part-woven through alternative tops in order to brace against the wind. These were later wired or nail-fastened. By the late 1850’s Post-and-rail fences became common types of Australian fences because more labour became available for digging post holes and splitting timber. The posts and rails of stockyard fences were made by using lengths of eucalyptus trees up to two feet wide, which were placed two feet into the ground and seven feet out of it. Stout saplings were then placed over two panels, and joined securely to the tops of the posts. Rails were placed close together to ensure a durability of up to 30 years. Wire was introduced as a fencing material around 1857 (hence post-and-wire fencing), however it didn’t become popular until later years as it was quite expensive. The strongest method of constructing these was to sink wooden posts into the ground at 30-foot intervals, string wire between them, and then support them with four or five non-load-bearing posts. Another important milestone in Australian fence history was the introduction of barbed wire to Australia in the 1880’s. This was when a much simpler form of drystone walling (which is where fences are constructed from stones without any mortar to bind them together) became common. Split timber posts were erected at a depth of at least two feet and wire was strained between the posts. Holes were then filled with rubble and excavated earth and crowned with a row of larger flat stones. The last of the more popular fencing options up until 1860 were hedgerows or hedges. Trees or bushes were planted at regular intervals or sown along existing fencing, and they were popular for controlling the movement of stock. Due to the maintenance required and their ability to harbour rabbits and snakes, they were more popular in Tasmania, however many still exist in Australia today. After a fence that will stand the test of time? Contact the experts at Dean-Wilson Iron on 3814 0076.